Grandville, MI - Hascall Steel Company, a multi-facility full service flat rolled steel service center headquertered in Grandville, MI, has installed a new high-production Single-Loop Tuurret Head™ Slitting & Packaging Line with a shape correction Cluster Leveler™ in its 150,000 square foot flagship Grandville, MI facility. 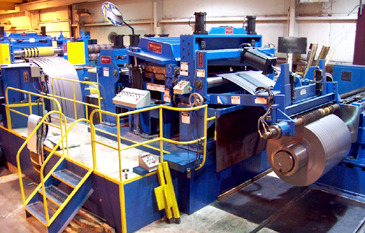 The new Slitting/Shape Correction Slitting Line is Hascall Steel's third Braner/Loopco Turret Head™ Slitting Line. 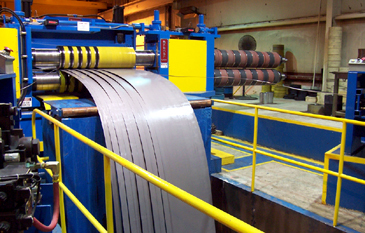 The new line has the capacity to slit and shape correct 60,000# x 72" wide hot rolled black, pickled, cold rolled, and galvanized carbon steel coils in gauges from .015" through 1/4", at processing speeds to 1,000 FPM. 60,000# x 72" x 1/4" Single Loop Turret Head™ Slitting Line with a Shape Correction Cluster Leveler™ that corrects edge-wave, center-buckle, and cross-bow strip shape defects. 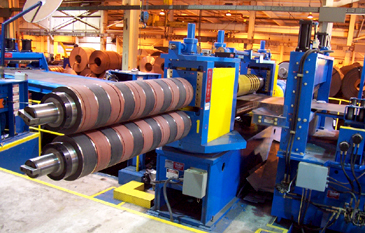 Compact High Pass Line: Hascall Steel's Slitting Line is a high-performance, compact high pass line arrangement that locates the Uncoiler and Recoiler at floor level, with the processing section elevated to match the largest coil OD. The design allows the strip to be processed through the line without reverse bending against the natural coil set. 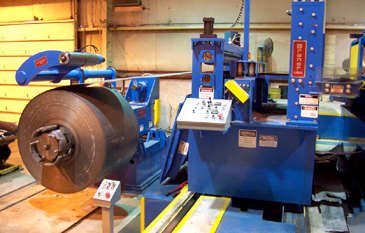 High pass line benefits include quick and easy coil threading, elimination of reverse-bend coil breaks, and elimination of strip surface damage from the deflector roll scuffing. The high pass line allows the Uncoiler and Recoiler to be tucked in close to the Entry and Exit Units, which shortens the overall length of the line. The shorter, compact line conserves floor space, speeds coil threading, and provides excellent coil tracking, which results in perfectly straight sidewall coils. The Compact High Pass Line design processes coils without bending the strip against the natural coil-set. The Uncoiler is installed tight against the Entry Unit, which minimizes coil threading time and conserves floor space. Turret Head Slitter™: A 9.000" arbor x 150 HP 2-head quick change Turret Head™ Slitter produces precise-width tolerance slit strips with minimum burr throughout the entire range of gauges and mechanical properties. The Slitter arbors are supported in precision machine tool quality bearings, mounted in huge one-piece, stress-relieved and precision machined solid steel housings. The rotatable Turret is mounted on a precision anti-friction ring bearing, which assures precise arbor alignment and makes head change effortless. The outboard arbor housing is supported on precision anti-friction machine tool slides and is engaged and disengaged by the hydraulic cylinder. Large aluminum-bronze blocks secure the adjustable upper arbor bearing boxes in the arbor housings. Axial arbor movement is "zero." The upper arbor bearing boxes are vertically positioned by motorized, anti-backlash screw jacks fitted with electronic encoder digital position readouts, for quick and precise vertical knife clearance adjustment. Compared with "slide-out" injector head slitters, Turret Head™ Slitters can be set up faster and change heads quicker, and because the multiple heads in a Turret Head™ Slitter are a non-removable and integral part of the one-piece turret, Turret Head™ Slitters are more rigid and precise than "slide-out" injector head slitters. Turret Head™ Slitters are precise and rugged, and offer bullet-proof reliability. Head change time is less than two minutes. Instead of separate "slide-out" slitter heads pushed in and out from a table, Turret Head™ Slitters have multiple slitter heads built into a one-piece, precision "turret" housing, which makes it absolutely precise. Notice the slitter head at the tooling se-up station is open and accessible wtih no frames, bases, or other obstructions that can delay slitter set-ups. Re-tooling and changing a Turret Head™ Slitter is easier and faster than with any other slitter design. Exit End: The Hascall Steel line is equipped with a Pad Tensioner that generates the strip tension necessary to produce tight, straight-wall slit coils. Tension is adjustable and regulated from the main operator console. Entry strip separator tooling is secured on lightweight aluminum alloy arbors that exchange with pre-tooled arbors in 60-seconds.